Acoustic Energy reveals 250 limited edition AE1 Mk III SE speakers | What Hi-Fi? If you have a few grand to spare on a pair of stereo speakers, then you'd probably like to stand out from the crowd. So how about buying one of only 250 pairs of Acoustic Energy's latest addition to its Reference Series? The speaker is offered in three finishes: an eight-layer, hand-finished piano black or pearl white, or a cherry real wood veneer. And if that's not good enough, AE will even do you a custom paint job. Designed and built in the UK, the AE1 MkIII SE uses a heavily braced 18mm MDF cabinet, lined with a 4mm steel plate, while the 12mm baffle is solid aluminium. The bass driver uses AE's spun-alloy cone inside a die-cast magnesium alloy chassis, coupled with a 38mm ring-radiator tweeter. Elsewhere there's also a completely redesigned crossover. 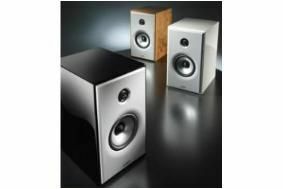 The piano black and cherry wood speakers will set you back £2500, or save up £3250 for a pearl white or bespoke finish.